On a daily basis, how do you typically feel? Do you usually feel vibrant, excited, hopeful, happy, and filled with love, joy and vitality? Or do you find yourself sluggish, tense, sad, anxious, stressed, and often worried? Most likely, you're somewhere in between and you fluctuate between positive and negative feelings. This is important to be aware of, because whatever feelings you predominantly experience through your day-to-day life does have a direct impact on your experiences, and on your life path. The law of attraction states that whatever your personal vibration is aligned with, is what you're attracting into your life. In other words, how you feel and think, directly reflect what you are manifesting in your life, whether you are conscious of it or not! If you're feeling good most of the time, and filling your mind with positive thoughts, you are in the process of manifesting more positive and pleasurable experiences into your experience. If you feel stressed, frustrated or upset most of the time, you're going to manifest more things to stress over, or more frustrating and upsetting experiences into your life. Getting stuck in a repetitive state of lower vibration, and frequently experiencing fear, tension, or insecurity, can be a vicious cycle… And we typically aren't taught how to ‘shift' out of these mindsets into more positive and empowering ones. Meditation and spiritual development are both great tools and resources you have available to you in order to help you climb up the ladder of positive emotions, no matter where your personal and emotional state of being currently is. Whether you are currently experiencing emotions of depression and anxiety or happiness and well-being, there are always more positive emotions you can experience. There is always room for more love, light and joy in your life. This is what makes a personal spiritual path so rewarding… You can always achieve greater levels of light and love in your life, no matter what you are feeling, right now. Then, when you continue to enjoy and experience more positive emotions, more often, you will begin to manifest more blessings and positive experiences into your reality. You don't have to struggle in fear, stress, anxiety or depression… You do have the choice and the ability to calm your mind, open your heart and to release these negative emotions into the light. Then you can fill this space with additional love and light that you will be able to carry around in the form of elevated emotions, increased joy and energy. But just how can you shift out of feeling something you don't want to be experiencing? In the moment when say you're feeling frustrated, sad, or overwhelmed, tune into the feeling. Is the feeling located in a certain place in your body? Is it rotating or moving? What qualities of energy does the feeling have? Is it pulsing, steady, or fuzzy like static electricity? How loud are you experiencing the feeling? Can you turn down the vibration? Can you visualize it further away from you, as something not attached to your being but that is actually outside of you. Could you let it go? Would you let it go? When? In the moment, when you realize you're experiencing something you don't want to, something you know is not in alignment with what you want to manifest more of, be aware of it… Tune into it, and let it go. Release painful emotions and challenging feelings into the light of the Divine. In any moment you can temporarily shift your vibration. Just for a moment… Release density, and tune into a higher vibration. When you take control of your personal vibration in this way, and you hold yourself accountable for how you feel by choosing to experience the feelings and states of being you desire, you save yourself a great deal of heartache, stress and tension. Be observant of the things and activities which help to lift your vibration, and assist you in living in love and joy. Then do these things when you're in need of a little boost. Listen to music you like, dance, sing, go for a walk, meditate, or watch a funny video and laugh. Take a proactive approach to shift into a higher vibration just for a moment, as this is directly correlated with improving and elevating your life. When you elevate your life, you align with the resources, assistance, and situations which will help you to manifest your dreams and intentions. Don't worry about changing your life all at once, or shifting into a positive vibration forever, just shift your energy in the moment, as elevating your life is an ongoing process. In addition, when you find you are experiencing a feeling which is uncomfortable and vibrating lower than you would like… Call in the assistance of your angels, who are more than happy to assist you in releasing density, and stepping into the higher vibrations of love and light. PS. 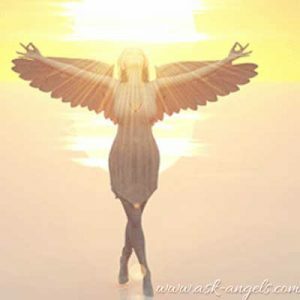 For further assistance in elevating your life experience… Check out our new Ascension Angel Course! Raise Your Vibration, 9 Ways to Increase Your Frequency Now! That was the most helpful information I have read in a while. I had no idea what was going on with me but my guardian angel whispered the site into my ear and here was this unbelievable guidance.